Since my Halloween post was only 2 posts down, I felt the need to add a couple more adorable pictures of our friends and family members who dressed up. My friends Cole and Pete had a great time with Halloween! 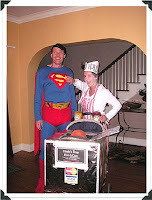 Their son Olin was dressed as a hot dog and Cole went as the hot dog vendor. They fashioned a hot dog cart out of Olin's stroller and Pete was the hero who would save the day if anyone tried to steal the hot dogs! Very cute idea, guys! 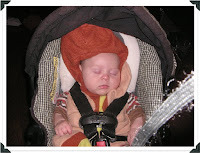 My new nephews were as cute as ever dressed as a pumpkin and a firefighter! Nice job Marissa! And, a big CONGRATULATIONS to Amy and Caroline for winning a diaper bag from Baby Blog Addict for her original costume as Amelia Earhart. You guys have done such an inspiring job, Dave and I are already brainstorming costume ideas for next year!